Read the latest news about the upcoming The Mortal Instruments: City of Bones Movie. Find information about the cast, crew, story, trailer and release date here. Since this is a no-spoiler page, there will be no details given here but you can get a general idea of what the movie is about. At first glance Clary is just a regular girl but why is that no one could see the murder that she witnessed in the club? Who is this stunningly handsome boy? What does she and her mother have to do with demons and other supernatural stuff? 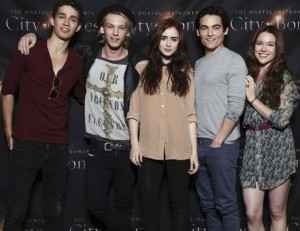 The first movie will undoubtedly serve as an introduction to all of the characters and world of The Mortal Instruments. As the trailer mentions, Shadowhunters are part human and part angel. They fight the demons and other evil creatures. There are also other types of supernatural beings in their world but humans do not know of them. A picture of the main cast. The books are told from the POV of Clary, a young teenaged girl who is very wholesome and rather boring at first. She fumbles her way through the story while trying to stay true to herself and her loved ones. It’s not easy when you have a lot very strong supernatural creatures after you and your friends! The fans seem pleased at this casting choice and so am I. She looks very much like the Clary described in the books, red hair and all. Sometimes in the trailer and in many of her photos she has the exact expression on her face that I think Clary would have -the “I don’t really know this will work and I’m sooo nervous but I am gonna try my best” sort of thing. I always imagined Jace as being classically beautiful, with perfect, even features. Here is an interesting fan discussion about the casting of Bower. My favorite in the cast has to be Meyers. He is just so handsome and haughty-looking. In my opinion he looks absolutely perfect as the “big Bad” Valentine Morgenstern. Meyers is the type that can charm you with his good looks but still be fanatic and crazy enough to feed you to the wolves. Great casting choice! The books are heavily into character development and romance. The movie? I expect it will focus much more on the action and supernatural elements of the series. The movie will be out on August 23, 2013. Copyright The Mockingjay Film Site. All Rights Reserved.